My Advice? Be a Good Painted Lady. Our society is obsessed with advice. Almost everyone is looking somewhere for guidance in some particular area. What’s the best smart phone to buy? What is the proper age to start potty training a toddler? What’s the best smart phone to buy for a potty-trained toddler? And for every person seeking advice, there are a hundred people willing to dole it out. In this age of social media, experts lie in wait at every sign-in. Well, all those experts need to step away from the keyboard and learn a little something from David. He’s a second grader, and as part of a class project, he wrote this letter to one of the butterflies that his class raised and was preparing to release. Advice doesn’t get any better than this. Hi. I hope you are warm and cozy in your cocoon and don’t get eaten when you come out of your cocoon as a butterfly. Stay away from spiders, mice, praying mantises, fire ants, birds, frogs, and snakes. Be a good painted lady. Just stay in your cocoon. Because it’s not if you’ll be devoured, it’s when. Did I mention there’ll be fire ants? And if you’re wondering, the best smart phone to buy is the one with the potty-training app for toddlers. 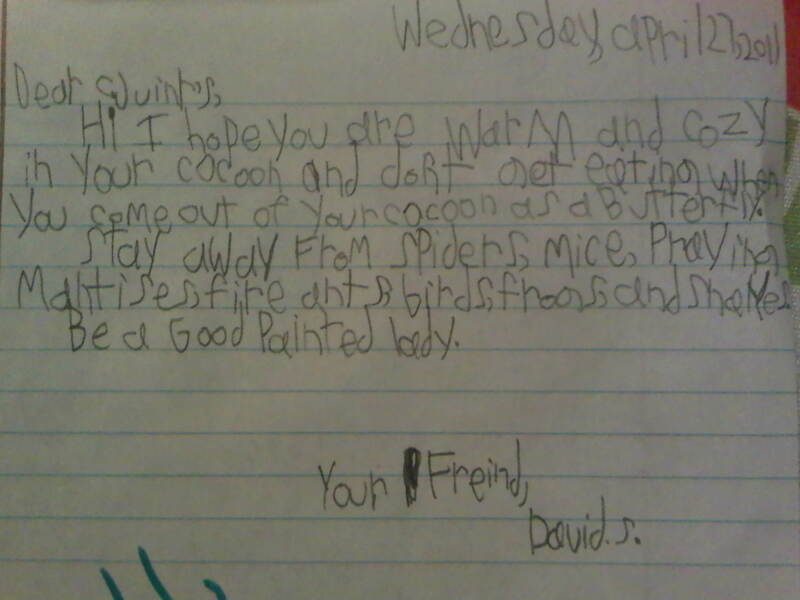 Thanks to Amy for sharing her son’s wise words; David certainly seems to have his mom’s knack for writing. Our advice? Go check out Amy’s site Life from the Trenches. You’ll be glad you did. And speaking of advice, we have a writing assignment for you and your child. What is the most important part of being an adult? Send us what your writing prodigy comes up with. We’ll feature the best responses on the blog, and everyone who replies to the prompt by Memorial Day will be entered in a drawing for a Starbuck’s gift card. Because adult lesson number one is that caffeine is essential. UPDATE: Sometimes life just isn’t that funny. They live in Joplin, Missouri, to be exact. Sorry for not responding and sharing like normal. Joplin, MO and our home were hit hard by a tornado yesterday. It’s truly horrible down here. We were able to get the kids out to my parents – it’s not safe in our area. Keith and I are in a hotel (no power, water) but a roof, which is more than we can say for our house. Vehicles, boats, trees – all gone. Here’s a link to an article about the devastation in Joplin from The New York Times website. Amy, our thoughts and prayers are with you, your family, and the people of Joplin. Posted on May 23, 2011, in Miscellaneous, School Assignments and tagged Chase McFadden, Humor, Ironic Mom, Kids, Leanne Shirtliffe, Life from the Trenches, Painted lady butterfly, Potty training, Smart phones, Some Species Eat Their Young, Stuffkidswrite.com. Bookmark the permalink. 11 Comments. “There’ll be fire ants.” That’s just good truth for all of us in life. Great post again. If someone had told me that when I was younger, it would have saved a lot of headaches. And fire ant bites. Where was this David kid during my third year of college? I love this. He is so sweet. And sincere. And scary. And he named his butterfly C. Junior. David is wise beyond his years, for sure. That definitely must have been the hippest butterfly. He is. He comes from good humor genes. That gave me a good guffaw. David’s butterfly may have some gender-identification issues. Is C. Junior a guy? Or a lady? So very sweet. I will likely feel terrible the next time a butterfly decides to go kamikaze against my windshield window. Windshields would be a nice addition to David’s thorough list of ways that the painted lady butterfly might be eliminated. Have fire ants made it up to Joplin? Really? I was just basking in the Iowan certainty that fire ants don’t live here, free to let my children wander without fear of the painful bite. David is very wise, and I love how it calls it his painted lady..
“Don’t be a floozy.” Words to live by!